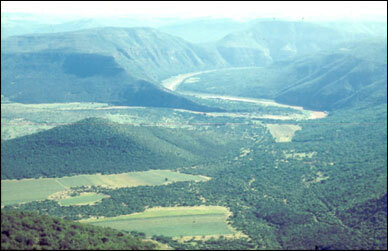 The Great Kei River, near the southern boundary of early farming settlement. The coastline of the Eastern Cape is treacherous, and several ships ran aground or sunk offshore after Vasco de Gama rounded the Cape of Good Hope in 1498. Some of the best known wrecks include the SÁ¢o JoÁ¢o (1552), JÁ¢o Bento (1554), Santo Alberto (1593) and SÁ¢o JoÁ¢o Baptista (1662). As the survivors made their way to safety, they encountered various groups of people with different languages and lifeways. Generally, Khoe (KhoiKhoi) pastoralists dominated the area around Port Elizabeth, up to the Fish River, while San hunter/gatherers lived in the Drakensburg foothills and Nguni mixed-farmers lived throughout the Transkei. The names of some present-day groups, such as Mpondo and Thembu, were in use by the end of the 17th century. Somewhat surprisingly, the abeLungu clan in the eastern Elliotdale district trace their descent from shipwreck survivors. During the apartheid era, it was a common myth that Black farmers met White settlers at the Fish River in the 17th century as one group moved south and the other north. Archaeological evidence, however, shows that Bantu-speaking people were settled in the nearby Kei River valley by the 8th century AD. A later, 14th century movement of Nguni speakers probably absorbed these earlier communities. Clicks in Cape Nguni dialects, such as Xhosa, indicate an intense interaction with Khoe pastoralists. Both Nguni and earlier Black farmers were not particularly interested in the country west of the Fish River for environmental reasons; sorghum and millet cultivation is not successful in areas with winter rain. The Eastern Cape is also well known for its contribution to Stone Age research. Cave sites not far from Port Elizabeth, such as Albany, Wilton and Howiesons Poort, have given their names to various archaeological cultures. The Howiesons Poort has been of particular interest to interpretations about the origins of fully modern human behaviour. Dating to 65 000 to 62 000 years ago, it has yielded extremely old evidence for bow and arrow hunting and shell-bead jewellery (see prehistory of Durban). In addition, archaeologists have found decorated ostrich eggshell water casks at Diepkloof as well as decorated pieces of ochre at Blombos, both Middle Stone Age deposits in the Western Cape. All these cultural traits were possible because of the evolution of fully modern humans biologically. Beginning with Australopithecines, hominid bodies underwent a series of changes in the feet and hands, body proportions, and face and teeth. And most importantly, the human brain increased dramatically relative to body size. Fully modern human skeletons appear in the archaeological record about150 000 years ago, and they first appear in Africa (and possibly South Africa). Human footprints found at Nahoon Point, up the coast from Port Elizabeth, are important ancient evidence of modern human anatomy. In the set of three, the left footprint is remarkably well preserved, and fully modern. Scientists have recently dated the prints by optically stimulated luminescence to about 125 000 years ago. When the prints were discovered in 1964, they were the first of their kind anywhere in the world. There is strong evidence that diet was instrumental in the evolution of Homo sapiens. First, between about 190 000 and 130 000 years ago the climate in southern Africa was colder and drier than today, and as a consequence, the interior was largely uninhabitable. Sea levels were also lower so that a huge expanse of continental shelf became available for habitation. It follows that people congregated on the coastal plain. Marine resources there include shellfish rich in fatty acids that are essential for the development of the infant brain. Moreover, pregnant and lactating women can collect shellfish easily. After 130 000 years ago, sea levels rose, flooding the plains and any archaeological evidence for shellfish collecting. It is significant, though, that some shell middens along the present-day shoreline date back to 120 000 at places such as Klasies River Mouth, west of Port Elizabeth. At present, Klasies has the oldest evidence anywhere in the world for strandloper activity. • Theal, G.M. 1898-1903. Records of South-Eastern Africa. 9 vols. London: Government of the Cape Colony. • Velasquez Rojas, C., Hayward, J. and J. Loubser 2010. Shoreline: Discovering South Africa’s Coast. Cape Town: Struik Travel & Heritage.